Number of British businesses going bust hits four-year high. A piece in the daily telegraph highlighted that the number of British businesses collapsing into bankruptcy hit a four-year high last year as one in every 213 companies fell into liquidation. But it wasn’t just businesses feeling the strain last year. Data released by The Insolvency Service shows that the number of people in England and Wales who became insolvent jumped 9.4% compared with 2016 and more individual voluntary arrangements (IVAs) were taken out last year than ever before. 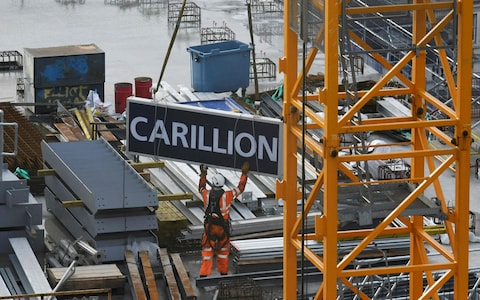 Carillion worth a £1bn in 2017, closed a year later worth £0bn. The British construction giant collapsed, becoming the UK’s biggest corporate failure in a decade. Hell on the high street continues. Everyone from banks, to supermarkets, department stores and restaurants are feeling the strain as more people shop online but have less to spend. House of Fraser is to close 31 stores to make it once again “viable” – and it’ll include 6,000 job losses. Mothercare’s decision to axe 50 branches in a desperate attempt to save the struggling baby chain. Right now, it’s a race against time for Poundworld. The UK’s best-known brands bankrupted by new technology. Maplin, the electrical/electronic component and gadget business Founded in 1976 has more than 200 shops in Britain and employs roughly 2,500 staff. Maplin went into administration in February 2018 following failed talks to find a buyer. It blamed a combination of factors, including sterling devaluation “post Brexit”, a “weak consumer environment” and the withdrawal of credit insurance. High street retailers have struggled to compete with the ongoing dominance of Amazon, especially in electronics where both Amazon and independent resellers tend to significantly undercut high street outfits on price. Maplin went into administration on the same day as Toys ‘R’ Us, having failed to find a buyer. Toys R Us the biggest retailer of its kind in the UK, with 105 stores across the country went into administration in February 2018, creating uncertainty for 3,000 jobs in the UK. In December 2017, Toys R Us said that the “warehouse-style stores” it opened in the 1980s and 1990s were “too big and expensive to run in the current retail environment”. It announced plans to shut 26 stores down at that time. Its problems started when its US parent went into Chapter Eleven last December. In February HMRC sought to recover £15 mn in unpaid VAT and this finally tipped the company into administration. UK entertainment retailer HMV launched in 1921. At its peak it had had 400 shops and was the country’s biggest entertainment retailer. However Amazon stole its crown in 2012, Spotify and other music streaming services arrived, and the firm entered administration a year later. It was bought out of administration a few months later but had to fire staff and shut shops to survive. Film and video-game rental firm Blockbuster started trading in 1985. At its peak in 2004 it had over 60,000 employees and 9,000 shops in 25 countries. However with the rapid rise of video streaming services like Netflix and Lovefilm, Blockbuster’s downfall came quickly: the firm filed for bankruptcy just six years later in September 2010. Electrical retailer Comet formed in 1933 and turnover peaked at over £2 billion in 2008, with 6,500 employees in 240 shops. However it was caught out by cheaper web-based rivals and the rise of smartphones and tablets. It was bought for a nominal £2 in November 2011. Just a year later all of its outlets had shut. One of several ‘Pound-‘ and ’99p’ discount stores, went into administration on 11 June 2018 after no buyer could be found for the business. It has 350 stores and 5,300 staff. The group has been struggling for some time, a victim of the success of other (more recent) discount stores, the tough price war going on in retailing and the marketing issues created by its ‘Pound’ label – limiting both what it sold and its customers’ perceptions of its range and prices. Benefits of transforming the Business. A key driver for a lot of these closures has been the level of disruption occurring in their respective markets. The clearest examples have been the dominance of Amazon and the impact of the intelligent customer. The operating environment for UK businesses is about to change as we redefine the relationship with the European and World markets seeking new or improved trade deals with the international business community.